Democrats have been trying desperately to hand President Trump and Republicans a defeat following the November elections. The momentum is clearly on our side, but we can’t let up for a moment. We MUST finish strong to win the special election. SHARE THIS INFORMATION VIRALLY! To the Democrats it’s not just an election, it’s more of an encore for Nancy Pelosi, the 77-year-old House Democratic leader who spent four years as the nation’s first female speaker, lost her majority in 2010 and now wants the gavel again. Moderator Chuck Todd also asked Pelosi if the attention around Ossoff was “overstated” given that he pulled around the same support that Hillary Clinton drew despite spendingmore than $6 million of his campaign haul. While Karen Handel released a radio ad from Georgia’s popular Senator Johnny Isakson this morning, dangerous liberal Jon Ossoff can’t escape his support of Nancy Pelosi. These special interest democrats are looking to elect one of their own. After all, 95% of Ossoff’s “grassroots” campaign is funded by donations outside of Georgia, highlighted by big money from Hollywood stars, and over a million dollars in contributions from California, New York, and Massachusetts combined. In fact, a recent filing showed only 2.5% of new contributions came from the state of Georgia. It’s no secret that Nancy Pelosi, her SuperPAC, and liberal backers have bankrolled Ossoff through this election. You can tell a lot about a politician by the way he votes and who funds his campaign. Clearly, Jon Ossoff aligns more with the dangerous liberal views of Nancy Pelosi, Hank Johnson and Keith Ellison than the beliefs of Georgia families. Click this link to share this individual post. This also happens to be a stance widely supported by two liberal Ossoff supporters, Elizabeth Warren and Bernie Sanders, so it’s no surprise Jon is ducking from the question. He can’t let the people of the 6th District see he is nothing more than a puppet for his left-wing backers. This is just another example of Jon Ossoff’s values fitting with liberals 3,000 miles away, not with the people of Georgia’s 6th District. 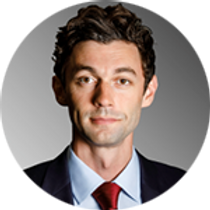 Want to make sure you saw so-called national security expert Jon Ossoff’s newest flip-flop on… national security. 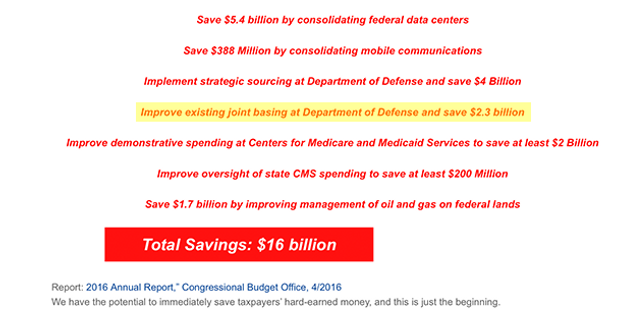 Last month, Jon Ossoff released his plan to “cut government waste” which included supporting a plan to “expand joint basing” that could destroy thousands of Georgia jobs. When reporting on Jon Ossoff’s second flip-flop on national security issues, the field of his supposed expertise, please consider the following comment by the Handel campaign. Flood the internet with this information. This is just a sample of what needs to be shared to fight this jackal before he can become part of the Anti-Trump Agenda. Click here for more posts to share.